Bulldog Fire and Security offers a comprehensive list of access control turnstile systems to assist with your needs. A properly installed turnstile system helps to ensure the safe movement of people through your facility or event. An access control turnstile system is ideal for situations that require controlled access of authorized personnel into specific areas, as well as providing accurate and verifiable occupancy counts in the event of an emergency. 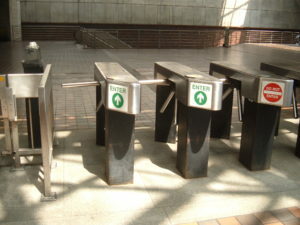 Access Control turnstile systems ensure one-way traffic and can limit access if someone does not present proper credentials. Ensure the safe movement of pedestrians in permanent or temporary situations. Restrict access while allowing easy movement to those with appropriate credentials. Integrates well with access control systems. A turnstile is a form of gate, which allows pedestrians to move from one area to another in an orderly fashion. Tripod Turnstiles – these units are typically found in sports facilities, transit stations, and amusement parks. Bulldog Fire and Security offers a variety of models to choose from, including portable and battery operated, as well as models that include ticketing and fare collection and drop arm models. Optical Turnstiles – these sleek pedestrian control turnstiles use infrared technology to record passage through the system. These systems are ideal for discreet management of high traffic offices, lobbies, and banks. Full Height Turnstiles – when integrated with an access control system, full height turnstiles allow for unsupervised protection that is ideal for areas such as parking lots, stadiums, transit stations, and factories. Bulldog Fire and Security offers a variety of models that are ideal for indoor and outdoor application. Access Gates and Barriers – these units allow you to provide access control along side your choice of traditional turnstile. These gates allow for Accessibility for Ontarians with Disabilities Act (AODA) compliance and enable safe and easy access for those with special mobility needs.